Do you dream of lush, breathtaking, coral-filled waters but simply have no space to fit a large aquarium? 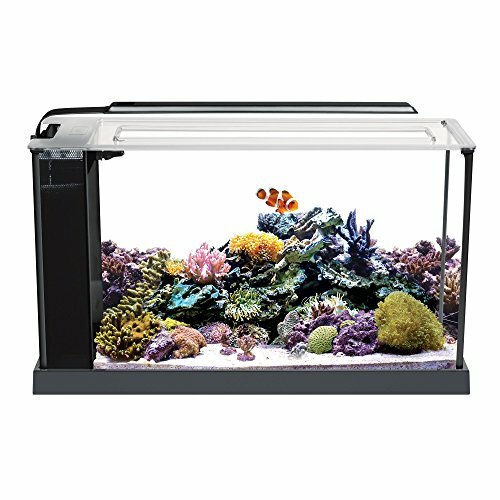 Then you can count on a nano reef tank to deliver the perfect look at the perfect size for you. These miniature tanks can fit into any small space in your living room, bedroom, office, or chill-out area, and be a beautiful slice of marine reef environment taken indoors. If you are keen on having a bit of ocean close by, then this article will prove an excellent read for you. Here, we’re going to cover all things nano reef: What it means, what thrives in such an environment, lighting, filtration and other tank setup needs, as well as what to look for and what to avoid if you’re in the market for buying one. We shall end the article with a handpicked list of the best nano reef tanks available today that we’re happy to recommend. What Thrives in a Nano Reef Tank? What Does a Nano Reef Tank Require? Is a Nano Reef Tank Hard to Maintain? Tank Only – or Complete Kit? A nano reef tank is a miniature marine fish tank that is designed to house marine life on a small scale. These tanks typically have a capacity of 40 gallons or less, meaning they have a small energy footprint. In spite of their small size, nano reef tanks can host a plethora of marine life, including corals, plants, invertebrates, and even small fish. Much life on the reef is macro, or very small, anyway, so having a nano tank means you’ll simply be scaling down on the size of marine flora and fauna you keep. A lot of people new to reef tanks start out with a nano to see how they like their new hobby before diving (pun intended) into a bigger aquarium purchase. Several marine forms thrive in these miniature tanks, however, it is important to avoid overcrowding. Go for corals that grow slowly – otherwise, you may have one species taking over the entire tank. Consider growing polyp corals as well as soft species like tree corals, thick finger leather, and cabbage leather. Members of the mushroom coral family such as the bull’s eye, lavender, and green-striped can also make their home here. Fish are a fantastic addition but you need to ensure that their adult size is no more than a few inches. This will prevent overcrowding and a situation where the fish outgrow their home. Some industry-recommended nano reef fish include gobies, blennies, clown fish, and firefish. Remember not to keep too many fish in the tank to avoid stressing them. You can also add macro algae, crustaceans, and sea-stars to complete your tank’s ecosystem. Achieving the lofty title of “best nano reef tank owner ever” may be hard but it’s not unachievable. There is certainly a lot of thought and work that goes into making these miniature ecosystems spectacular. Lighting serves two purposes in a nano reef tank – aesthetic appeal and functionality. Naturally, you want to have a vibrant looking aquarium and lighting can help you achieve this. It is the functionality aspect, however, that should be your biggest consideration. The aquarium’s inhabitants should help you determine which is the best lighting. If you have a fish only (FO) nano reef tank then your lighting requirements are not so high. As a broad rule of thumb, you should have one to two watts of lighting for every gallon of water. A nano tank that hosts FOWLR (fish only with live rock) has a higher lighting requirement. This is because live rocks need more light to function properly. Reefs that are home to corals, anemones and other living organisms require even more light. Low-light corals require at least four to six watts of lighting for every gallon of water, while photosynthetic corals need 10–12 watts per gallon. Is it possible to calculate the number of watts per gallon your light fixture gives out? Absolutely. You can do this by dividing the total wattage of your light fixture by the capacity (number of gallons) of the nano aquarium. Let’s illustrate this point with a 55-watt bulb. Using it over a 20-gallon aquarium will yield just over 3 watts of light for every gallon of water. This may work in a FO tank, but not in FOWLR or a true reef tank. Filtration is crucial to any aquarium. It removes harmful toxins such as ammonia and nitrites, in addition to keeping the water clean and clear. Dirty water creates the perfect environment for bacteria and other unwanted algae to thrive. This can stress the fish, bring about diseases, and even cause death. Nano aquariums are more vulnerable to toxins due to their compact size. As such, they require extra attention. Additionally, filtration promotes water movement and surface aeration ensuring that oxygen is dissolved correctly. Mechanical filtration removes undissolved waste such as excess food and general dirt from the water. It doesn’t, however, eliminate any dissolved waste or debris, bacteria, and algae. Most filters use mechanical filtration to catch any free-floating particles that are unable to pass through it. The dissolved waste that mechanical filtration can’t deal with is handled by chemical filtration. This type of filtration works to eliminate dissolved waste and toxins from the water. Biological filtration is also referred to as the ‘nitrogen cycle’ or simply ‘cycling’. It uses living entities to break down waste. These entities are beneficial bacteria that take in oxygen and convert ammonia and nitrite into a harmless compound called nitrate. Nitrate is then removed from the water chemically or during a water change. The three filtration methods are usually combined to build an effective filtration system. A submerged filter system that contains a protein skimmer works bests in nano reef tanks. The protein skimmer removes organic matter through air bubbles that bring this waste to the surface in foam form. This foam finds its way into an enclosed compartment. Due to the compact and sensitive nature of nano reef tanks, it’s important to get lighting correct the first time. T5, metal halide and LED are some of the best lighting systems that you can use. T5 lamps have been on the market for years and are loved by many nano tank enthusiasts. Many people appreciate how easy they are to operate and the fact that they don’t emit a lot of heat. Today, we have hybrid lights that combine T5s and LEDs to give you the best of both worlds. With the hybrids, you can experience the precision of T5s and the efficiency of LEDs in one fixture. Metal halide lamps are popular for their lighting intensity. Since a single bulb produces a great amount of light, you won’t require many bulbs to achieve the illumination level you need. The flipside is that this lighting generates a lot of heat, which can elevate the water temperature to dangerous levels. As such you will need a fan to dissipate the heat before it reaches the water. LED lamps come with a ton of benefits, the chief one being their energy efficiency. They don’t generate a lot of heat and the little amount that is produced is pushed upwards and away from the tank. Some LED lights provide a wide color spectrum, enhancing coral growth and other marine life. You will also find several that mimic natural ocean cycles, making your slice of the sea look more realistic. 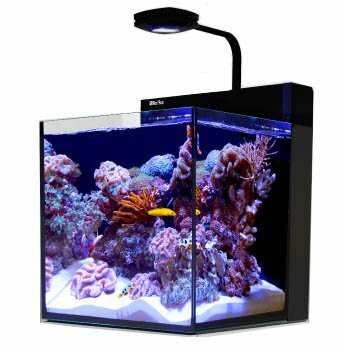 Since many nano tanks are sold as complete aquarium kits, they come with pre-installed LED lighting systems. In this way, the lighting choice is already taken care of for you. Maintaining a healthy ecosystem in a standard reef tank is hard enough, let alone in a nano. The thing that makes them desirable – their compact size – is the same thing that presents the biggest challenge to a reef-keeping enthusiast. Part of daily maintenance involves keeping the pH and salinity levels stable. Nano tanks hold less water volume which can evaporate or get contaminated easily. Keep an eye on the water parameters as evaporation will affect the condition of the water too. You will also need to perform water changes on a daily basis. Ideally, you should use reverse-osmosis water to avoid any contamination. Premix it with the salt mix before introducing it into the tank. With a miniature tank, things like overfeeding can lead to an organic waste build-up. This will, in turn, lead to increased ammonia and nitrite levels none of which are good for your aquarium. Carefully clean your tank on a regular basis, preferably weekly, if not more. Gently siphon the aquarium’s substrate to remove accumulated debris and other waste matter. Once you are done with the cleaning, perform a water change. To perform water tests effectively, you will need basic testing equipment that checks for ammonia, nitrite, nitrate, pH, KH, calcium, and temperature. If you find or suspect, that something is off, don’t assume it will go away. Since the environment in a nano tank is extremely contained, small things can quickly escalate into major issues. Maintaining a nano reef requires commitment. If you are willing to invest your time and resources, you’ll become a pro in no time. Buying a nano reef tank requires thought and planning. Many first-time owners get discouraged when things don’t turn out the way they wanted. They end up stuck with a tank that simply doesn’t work for them. Some people like putting things together by themselves. They will opt for the tank-only route and then purchase everything else separately. However, it is worth noting that nano reef tanks are extremely sensitive, and any miscalculation can cause major mishaps. We recommend leaving this option to expert aquarists. A complete kit, on the other hand, will save you time, money and headaches. This is because everything in it is designed to fit and work in sync. The only thing you will need to purchase is a heater. Location and how much room you can spare should help you determine the best size of nano reef tank for you. The more room you have, the larger the tank should be. We recommend starting off with a 20-gallon if possible because, contrary to popular belief, small isn’t necessarily better. The smaller the tank, the more precision is required. Additionally, you should think about where you will place it. Remember, a nano tank may seem small and “light,” but it will become extremely heavy once it’s filled with water. Rather than placing it on a desk, consider using a purposely designed stand which can support its weight. Many of us are blown away by the aesthetic appeal of a given tank, which is fine since you want to have an attractive looking aquarium. However, checking its quality is more important. The tank may look good but it might be leaky, have badly performing filters or even a poor lighting system. Research the product first, check online reviews to see what other buyers are saying about it. Spend a little more money on a tank made of durable material. Settling for the cheapest-looking model may see you spend more money fixing it. Glass Vs Acrylic—Which is Better? To start with, both materials are durable and have the ability to hold aquatic lifeforms perfectly. This is really a question of preference. Below is a list of the pros and cons of each. More difficult to drill for bulkhead fittings. More likely to break upon impact. Can be drilled easily for bulkhead fittings. Can be re-polished, refinished, and repaired. Less likely to break upon impact. Can yellow in the course of time. Porous and can absorb chemicals. Certain shapes, like bowfront and hexagonal aquariums, distort the view of your reef. The larger the surface area, the easier aeration will be. Removal of any harmful gasses is critical to the lives of your marine life. Some shapes may restrict the number of fish you can keep and even restrict their movement. Tanks that are too tall can prove difficult to decorate or clean. Furthermore, the light may not adequately reach the bottom, limiting growth. 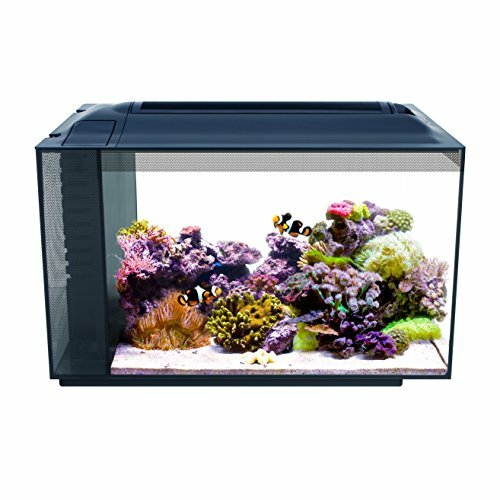 The nano tank you choose should suit the type of coral you intend to keep. Photosynthetic corals will require a lot of light, meaning that a shorter tank is best because it optimizes the light source better. Temperature fluctuations are known to stress and cause diseases in fish. They also affect corals. It is therefore important to maintain the right temperature. As far as heaters go, you can choose a hang-on heater or a submersible heater. Hang-on heaters are pretty easy to use but a submersible version offers more equal heat distribution. You can also opt for an in-line heater which is well-known for regulating temperature. Whichever heater you choose, go for a high-quality one rated for the size of your nano reef tank. This will minimize temperature fluctuation challenges and uneven heat distribution. Most nano reef tanks come with filtration systems, so you may not have to think about purchasing one. However, do some research online and find out how well the filter in your preferred tank works. Many nano reef tanks come with a warranty – for both the tank and its accessories, though the timeframes may be different. You will need to read the terms and conditions before you make a purchase so you understand the level of coverage. While the manufacturer’s warranty is important, it’s in your best interest to purchase a high-quality model even if the warranty is shorter. It will give you fewer headaches and make a better home for your tank’s inhabitants. It is only natural to go for a cheaper option. We all do it. Price is definitely a major factor, but don’t let it be your only consideration. Take time to research different models until you find a tank that matches your needs. If the price of your preferred product is rather high, look for another model that offers similar features. In the end, your tank’s inhabitants are precious and sensitive, so you should buy them the best home you can afford. The demand for nano reef tanks continues to soar as more people turn to these miniature aquariums. With so many models out there that cost a fraction of the price of a standard aquarium, it is easy to understand why. However, it’s also easy to pick one that looks good but does not fulfill your needs. In this section, we will look at the best nano reef tanks available today (in our opinion) and what you can expect from each specified model. This rectangular 20-gallon nano reef tank is stylishly elegant, compact, and bears a superior build. It comes in a rimless design that provides more surface area for light to penetrate. It’s loaded with HD LED lighting allowing for a full-color spectrum with numerous lighting effects. This is a tech-savvy tank that offers you integrated Wi-Fi controls which are compatible with both Android and iOS devices. It also comprises filtration and circulation systems as well as an automatic top-off unit and a user-friendly power center. Dimensions: 18 inches by 18 inches by 18 inches. LED AI Prime HD 55W lighting system. REEF-SPEC® filtration and circulation systems. This product is at the higher end of the price range. However, its overall build, aesthetic appeal and load full of features are worth every dollar spent. This sleek looking nano tank is made from glass and has a curved front panel. It offers you uninterrupted viewing angles on the front as well as the sides. Its black cover opens up to easily facilitate feeding and tank maintenance. Its LED lighting mimics natural light cycles, allowing you to enjoy sunrises, sunsets, and moonlight. Coralife comes with a customizable built-in filtration system that is easy to set up and maintain. The filtration system is hidden from view at the back of the aquarium, ensuring the overall look remains sharp. Recommended accessories include the BioCube protein skimmer, BioCube algae-cleaning magnet, and coral deep six hydrometer. Dimensions: 15 inches by 16.75 inches by 17.5 inches. Sleek modern hood with vibrant LED Lighting. Cooling Fan: 50 mm, 15.83 CFM, 25.5 Db. Quiet submersible pump, dual intakes and adjustable return nozzle. Clear glass back panel for easy refugium set-up. Compatible with all Biocube accessories. Pump and fan reported noisy by several owners. The cube shape means you lose some surface area. Part of a renowned family of nano tanks, this model plays in the top league. Loaded with premium features, the JBJ MT-602-LED Nano Cube recreates the beautiful coral reef for your viewing pleasure. It boasts the Ocean Pulse wavemaker that creates natural water currents, which run anywhere between ten seconds and six minutes. As a result, your fish tank will have better oxygen circulation and be rid of surface waste build-up. This all-in-one model consists of compact fluorescent daylights and Nite Vu LEDs (LED night lights). It also has a 3-stage filtration system that is customizable, and, lastly, two programmable circulation pumps. 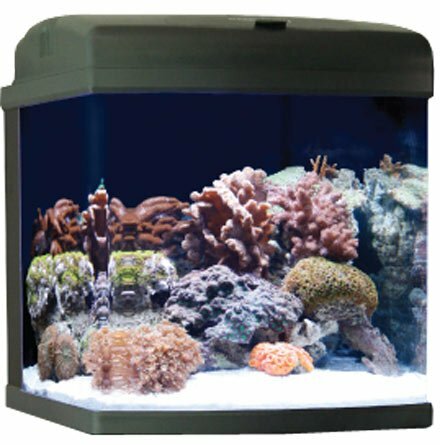 The fluorescent day lights will easily meet the lighting needs for most soft corals in your aquarium. The LED night lights add a little spice to your viewing by increasing your ability to observe nocturnal behaviors. Finally, you have the in-built failsafe thermal protector that automatically shuts off the lighting system in the event of fan failure. This prevents overheating and ensures that the water temperature in the tank stays stable. Dimensions: 22.5 inches by 25.5 inches by 26 inches. Integrated cooling system: 4 fans. Smart filtration: removable transparent filter basket. Two directional flow nozzles and two pumps for dual returns. JBJ Nano-Cube hoods are compatible only with JBJ LED light strips. Are you looking for a top-of-the-range nano reef tank that is perfect for beginners and seasoned aquarists alike? If so, this might be the one for you. Although you’ll have to invest a little extra in accessories, once you’ve got this tank properly set up, you can’t go wrong. 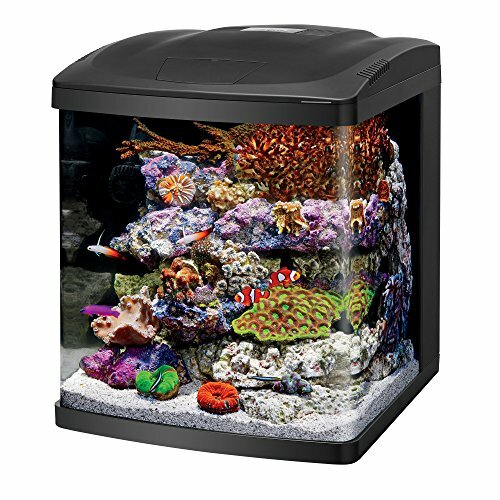 This model is pretty stylish and built for saltwater aquariums using high-quality materials. Its clear glass offers you the perfect view of your tank inhabitants. This tank has a ‘honeycomb section’ where its 3-stage filter remains concealed from view, ensuring attention is not taken away from your fish. This aquarium kit comes with a 11000k high-output LED lighting system which also mimics daylight and nighttime cycles. These conditions are ideal for coral growth. That said, this model’s lighting is not recommended for growing SPS corals. Dimensions: 20.5 inches by 11.6 inches by 7.5 inches. LED lighting system: 37 LEDs. FIlter output: 55-80 gallons per hour. Reef-capable LED lighting for optimal coral growth and color. Touch-start day & night illumination. Some owners have complained about its high noise levels. This reef tank may be small, but its stylish design provides fantastic views of your mini reef and looks good with any décor. The hidden filters give it a sleek appearance. Plus, it performs just as well as it looks. The Fluval nano reef tank kit is a slick system with an all-aluminum waterproof casing. The filtration area is concealed in a honeycomb which serves to improve aesthetics and keep unsightly stuff hidden. Reef tank enthusiasts understand the importance of keeping the water in the aquarium clean and clear. For this reason, this aquarium kit comes with a 3-stage filtration system that helps keeping it clean and with stable water parameters much easier. With this model, you can expect a 14000k high-output LED lighting system that mimics daylight and nighttime cycles. Dimensions: 22 inches by 15 inches by 11.5 inches. LED lighting system: 31 LEDs. FIlter output: 132 gallons per hour. Removable cover for full access. 3-stage filtration system with a pump. The LED lighting system lacks a timer function. Having looked at our top choices for 2019, let’s now go through the set-up process for any of these nano tanks. A nano reef tank, one with pre-installed lighting and a filtration system. Live substrate, preferably live sand. Test kits to check salinity, pH, ammonia, nitrite, nitrate, and phosphate. Set aside a few hours because it takes time to properly set up a reef tank. Place the tank in an ideal place, preferably away from direct sunlight. If you aren’t using a stand, make sure the supporting surface is flat and is sturdy enough to hold the weight. Remember that it will be much heavier when filled with water. Place a sealed plastic bag full of reverse-osmosis (RO) water in the tank before proceeding to fill it with more RO water. The plastic bag is meant to create “room” in the tank for the later insertion of rock and sand. The above step is important. If you didn’t allow for the weight of these items and the water they displace, you could overflow your tank and/or have no capacity left for the RO water. You can buy RO water from a pet store or make your own at home. Check the tank for leakage. If there is none, you can plug in your power source. Add the salt, ensuring that you follow the manufacturer’s instructions carefully. Use the hydrometer to measure salinity. Ideally, the salinity in your nano reef tank should be 35ppt or between 1.024 and 1.027 specific gravity. Place the heater in the water and let the temperature rise to 78 degrees Fahrenheit. As soon as you have the correct specific gravity and the temperature is right, add your live rock. You can be as creative as you want with the live rock. If the style doesn’t feel right, you can always go back and change it later on. Add the sand evenly throughout the tank. It’s very likely that the sand will make your water cloudy but this will clear up in a matter of days. The nitrogen cycle comes next. Introduce a source of ammonia, such as fish food, into the water. After a day or two, check the ammonia and nitrite levels. Repeat this process daily for at least seven days to ensure ammonia and nitrite levels stand at zero. By this time, you will start to see tiny crustaceans around the live rock, these will soon populate the substrate. After seven days, if the ammonia, nitrite, nitrate, and phosphate levels remain at zero, you can add your coral and fish. Enjoy your nano reef tank! Buying the best nano reef tank you can afford is just the beginning of the story. Creating a healthy environment for aquatic lifeforms in a small space requires dedication and commitment. If you’re willing to put those qualities into your tank, your slice of the ocean will thrive. What better reward could an aquarist ask for? Do you have any questions, comments, or feedback for us? If so, leave your thoughts in the comment box below. We will answer every question and comment.